From 1826, iron gangs were a common punishment for more serious offences such as repeated absconding. Men sentenced to work in irons were formed into gangs to build roads and bridges. They worked in leg-irons during the day and were shackled together at night in a stockade or in moveable wooden caravans that were towed to the work site. George Mildmay, who was assigned to James Webber in 1830, was sentenced to 12 months in an iron gang in 1833 for absconding from Tocal for the third time. He had received 50 and 100 lashes respectively for the two previous incidents of absconding and prior to that 36 lashes for neglect of work and another 36 for feigning sickness. 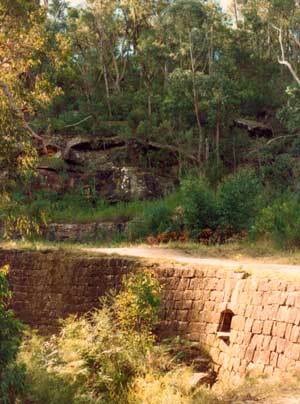 Several of Tocal's convicts worked in irons building the Great North Road from Sydney to the Hunter Valley. The term 'chain gang' seldom appears in colonial records. In the convict era they were normally referred to as 'iron gangs' and to men 'working in irons'. Right: convict stone work surviving today on the Great North Road.